Disney’s new computer-animated feature Frozen is a mixed bag of comedy, fantasy, and musical elements that’s impressive to look at but doesn’t fully sink in on an emotional level. Jennifer Lee’s screenplay is a very loose adaptation of the 1845 Hans Christian Andersen fairy tale The Snow Queen. Though the many songs (composed by Robert Lopez and Kristen Anderson-Lopez) are pleasant, boasting occasionally witty lyrics, it’s unlikely any of them will become classics on the order of Disney’s best. Most are Broadway-style showtunes, usually furthering the plot but often sounding more like sung monologues than standalone songs. Josh Gad steals the entire film as Olaf, a snowman who longs to bask in the summer sun. At the center of the story are two royal sisters who were very close as children, but are estranged as young adults. Elsa (voiced by Idina Menzel), soon-to-be Queen of Arendelle, turns everything she touches to ice, including her younger sister, Anna (Kristen Bell), who nearly dies after her head is accidently frozen during playtime. Trolls revive her, but warn that a similar icy injury to her heart could prove fatal. They wipe her memory of any traces of Elsa’s magical abilities. Elsa is fitted with a pair of protective gloves and kept hidden from Anna, and all of Arendelle, until Coronation Day. Much like anyone deemed “different,” Elsa is banished from Arendelle as a freak once the townsfolk discover her X-Men-like ability to freeze any surface and create snowstorms in summer. Her cold-creating skills are poorly honed, spiraling out of control whenever she becomes overly emotional. So she retreats to mountain ice palace of her own creation, not realizing she has pushed Arendelle into a perpetual state of winter, which ruins its fishing and farming industries. Anna, who now partially understands why she was separated from her sister (though she doesn’t know about her near-death experience), pursues her. 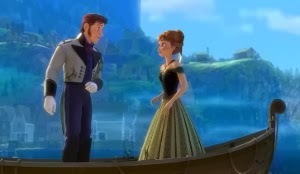 While she believes her heart is with a local prince, Hans (Santino Fontana), she meets ice trader Kristoff (Jonathan Groff) and his loveable reindeer, Sven, in the wilderness. As Kristoff attempts to aid Anna in reaching Elsa, a relationship slowly builds. Frozen is fairly plot-heavy and the youngsters at the sold-out matinee I attended seemed mildly restless during its opening act set-up. But older kids (not to mention adults) are likely to appreciate the initially intriguing story. Unfortunately, Queen Elsa is unconscionably underdeveloped as a character. Her blessing/curse never crystalizes as the meaningful metaphor it could’ve become (metaphor for what, I’m not sure—that was supposed to be the filmmaker’s job, but connecting it to an inability to properly express/control emotions would’ve been a good start). Elsa is basically abandoned for the entire middle of the story, leaving her without enough of a presence to garner much sympathy. Frozen also lacks a well-defined villain. While one certainly emerges (no fair saying who), that element is introduced so late that it doesn’t make much impact. Basically, Elsa is embarrassed by her inability to control her powers and Anna (with Kristoff’s help) is determined to bring her back to Arendelle. Good start, but not mined deeply enough. Though his big number, “In Summer,” is essentially filler that unnecessarily pads the running time, Josh Gad delivers big laughs as Olaf. The diminutive snowman could’ve easily been treated as cutesy fodder for the youngest viewers, but Gad’s inspired delivery makes the character a true highlight (it helps that he’s been given the best jokes). A running gag about Kristoff’s friends allegedly being “love experts” has a great payoff. Alan Tudyk has fun voicing the weaselly Duke of Weselton. 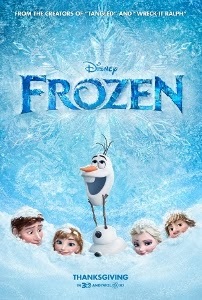 And Kristen Bell and Santino Fontana deliver the film’s musical highpoint with a duet on the refreshingly poppy “Love is an Open Door.” In other words, there’s a lot of fun to be had with Frozen, a sure bet for family viewing this holiday season, even if it doesn’t quite add up to a classic for the ages.